Last Day of March Madness - and the issue is live! Two huge announcements today! Today is the last day of the Technique Junkie Newsletter March Madness sale. Everything on my site is 10% off through the end of today. Simply place your order and write "March Madness" in the comment section and I will refund 10% of your total order. If you can't find the comments section, don't worry -- I will automatically refund 10% of your order. It is a great time to renew, get a CD you have been thinking about, order back issues, or even subscribe! You can always send me an email with what you would like and I will send a discounted invoice to you, too. The second announcement is that the April 2011 issue is LIVE. Subscribers can go HERE to the Subscriber's Only Page to log in to see the new issue. There are 15 fun tutorials waiting for you! Today's card uses one of the tutorials: Graduated Color. Note how my Stampin' Up! 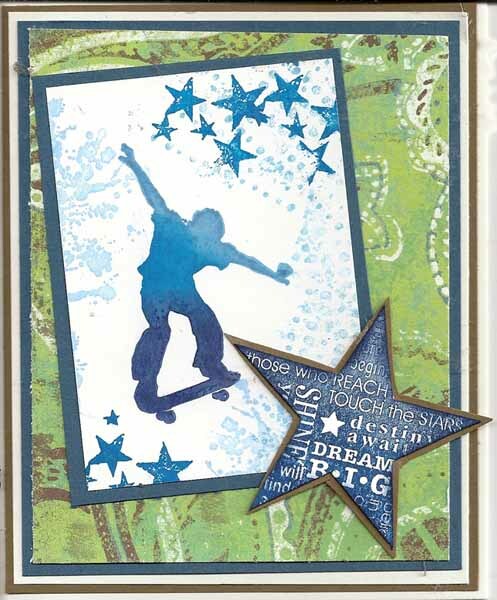 surfer dude is colored -- you can learn the easy way to do this with the April issue. Need your password? No problem -- just email me and I will get it to you. Enjoy the new issue -- and make sure to take advantage of the March Madness sale, too! I know, I know. Try that Technique is on Thursday. I actually MADE this card on Thursday, but it took me until today to post it! sometimes life is like that. This is an example of Double Bugging, the TJ Newsletter Technique for Try that Technique Thursday. I wanted to use two folders that were both very detailed since I usually gravitate toward the same two folders every other time I have done this technique. I love the way this turned out! This technique is from the June 2009 issue of the TJ Newsletter, and can also be found on the Emboss or Die CD. The image is from Inkadinkado. 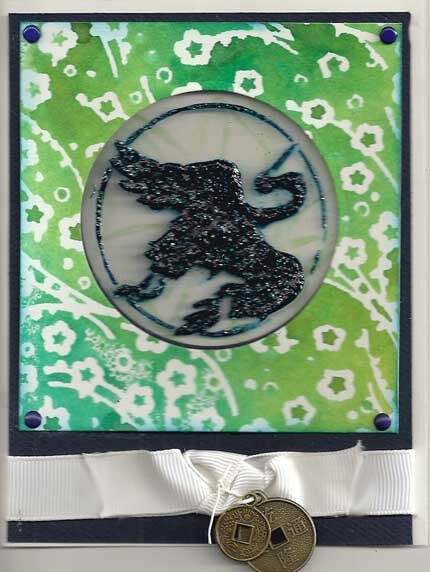 This By the Inch Card (Technique from the December 2010 issue of the Technique Junkie Newsletter) was a challenge card for the letter "I". I love this technique- so easy and such cool results. Plus I get to use up pieces of technique from long ago! The base of the inchies was a piece of Pigment Scrunch (February 2009 TJ issue). Yes, a piece that I made two years ago! I don't know whether to be proud to have used it or ashamed that I kept it so long! 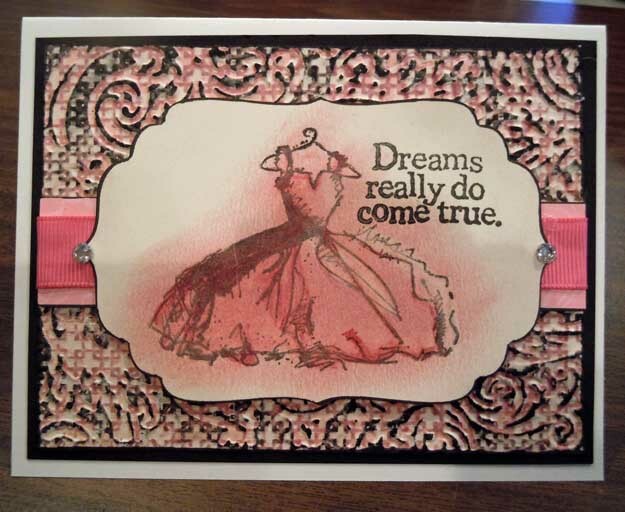 Stamps are newly acquired from Stampin' Up!. 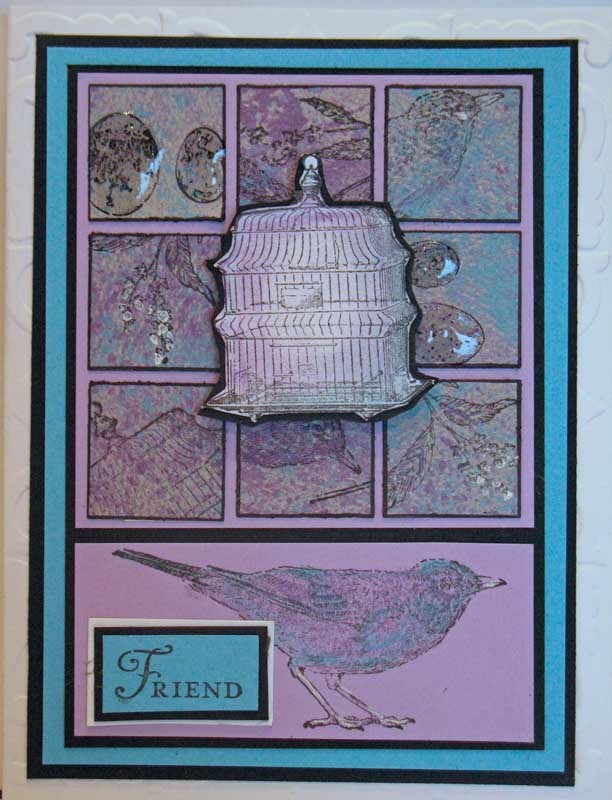 The gorgeous paper is from Paper Temptress -- it is duo toned Ice Blue and Grape, and just fabulous in person. Hope you enjoy your weekend! How convenient for me that Blogger's Challenge has the birthday theme, since I just sent this card out for another masculine birthday challenge. My card uses the Faux Barnwood Technique from the February 2011 issue of the Technique Junkie Newsletter as a background. The stamps are new-to-me from Stampin' Up!. I thought the little Tim Holtz Gears were perfect with the stamped image. I Love Great Paper. I think I need a button to wear on my chest with that saying! Paper Temptress, our giveaway sponsor this week, is all about GREAT paper. I tend to horde it, but Patricia is trying to break me from that habit! It is a habit one lucky winner can break, too -- with the $25.00 gift certificate to Paper Temptress as our giveaway prize. The card above uses Paper Temptress papers. 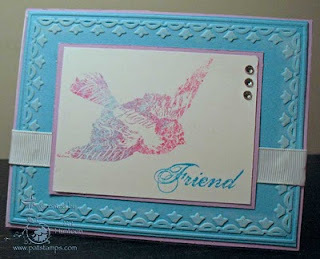 The fun thing about this card is that the beautiful paper used for the teal and the orchid are the same paper! One side is teal, on orchid -- "blue ice" and grape" double sided paper. It is just luxuriously beautiful! 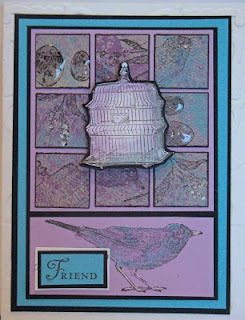 I used the Tissued Color Technique (February 2011 issue of the TJ Newsletter) and layered that on the Grape side of the paper, then layered that on the teal piece that was done using the Cuttlebug Highlights Technique (Emboss or Die CD). 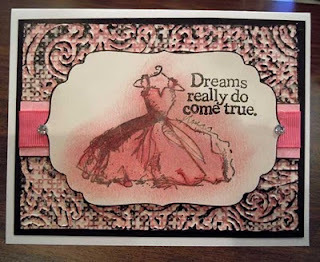 All-in-all a simple card, but Paper Temptress paper just makes it pop! 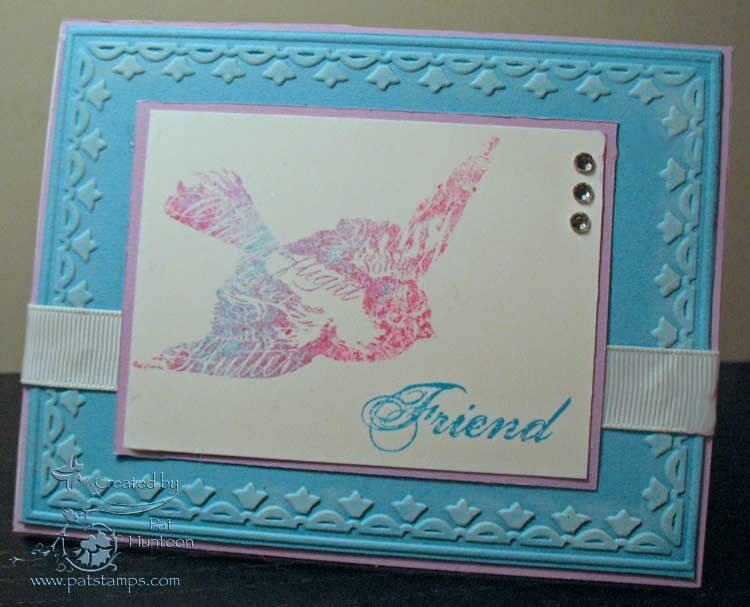 Stamps: Close To My Heart, Embossing Folder: Stampin' Up! Go take a look at the gorgeous papers on Paper Temptress' site and dream about what you would order -- and don't forget -- use TJ15 to take 15% off of your order, too. To win the card and the $25.00 gift certificate, simply leave a comment on this message on my blog and make sure to leave me your email address. I will have my random number generator select a lucky winner on Monday, March 14th, at 9am. Good luck! 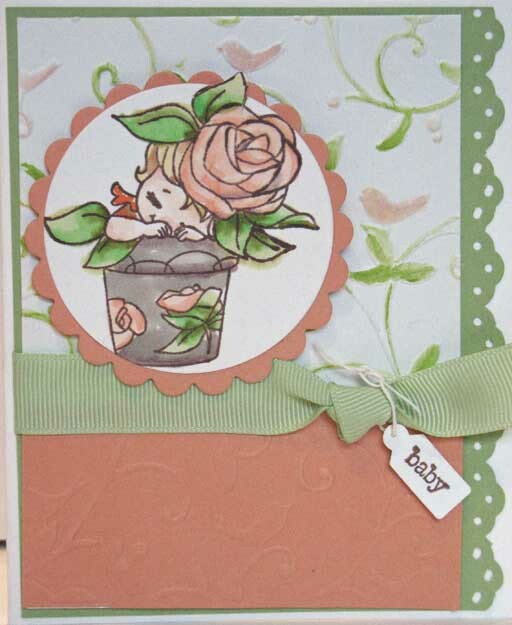 I recently received this adorable stamp from Susana's Custom Art and Card Design (from the Elisabeth Bell Collection) and thought it would make the cutest baby card. Blogger's Challenge this week is a color challenge- peach, white and green -- it was a perfect time to get it inky. My baby is colored with Copic Markers, and was cut using the Out of the Box Nesties Technique (which can be found on the new Technique Junkies Emboss or Die CD. The background behind my flower baby uses the Pastel Painted Pigment Technique (also on the Emboss or Die CD). I am normally not a pastel-type of person -- I tend to like earth tones and jewel tones the best -- but I really love this little cutie. I think it is the SCACD stamp! It is a little sad, though, I just can't get the colors to turn out right on the screen. This card is soft, and sweet, and soothing, and it just doesn't look like that here -- but trust me on this! I have to say, Viva Decor's Glitter Gel is pretty cool. 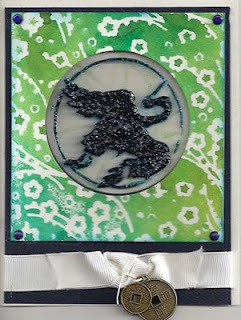 I love how it makes this Glitter Gel Window Card (April 2011 Technique Junkie Newsletter) look! It has a great texture to it that just has to be touched. What? You say you don't have any Viva Decor Glitter Gel? Well now is your chance to get some -- along with other cool Viva Decor products -- with our Giveaway today. Susana's Custom Art and Card Design is our sponsor this week -- offering a $25.00 Gift Certificate for one lucky winner to shop in her store! Of course, you are not limited to the Viva Decor products. Susana carries a bevy of unique and hard-to-find stamping items, paints, embossing folders, nesties, inks, etc. -- and stamps, too! 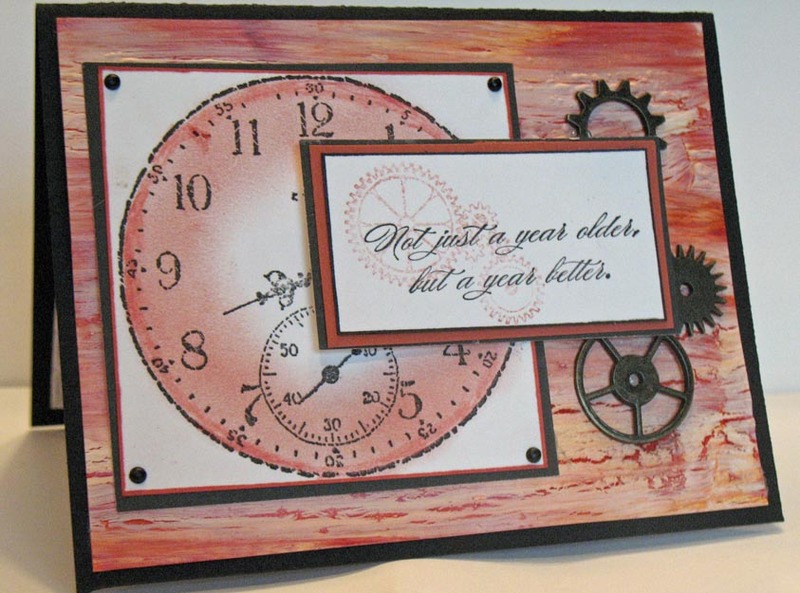 When you browse through Susanas Custom Art and Card Design, you will be delighted with the cool stuff on her site. As a junkie, I need a fix of cool and interesting stuff from time-to-time -- believe me, I know where to get it now! Make sure to use this code: SASTJ10 for 10% off your shopping cart, too! A little more about the card -- the bright front panel uses the Glimmer Press Technique - one of the 79 Technique Tutorials from the new Emboss or Die CD. The CDs are going in the mail TODAY! You can order your copy HERE if you have not yet done so. To enter this giveaway, go to Susana's site and find a product or two that makes you drool. Then simply leave a comment on this blog post telling me what you found and you will be entered! Make sure to leave your email address so that I can get in touch with you, too. My random number generator will pick a winner on Monday March 7th at 8 am. The $25.00 shopping spree awaits one lucky winner! Note that shipping is not included with the gift certificate. The winner of this gift certificate is Lynda Hill.